If you have any questions regarding early childhood services, please contact us for a FREE EARLY CHILDHOOD SERVICES CONSULTATION. Free Appropriate Public Education for All. The school district is required to provide a free appropriate public education for all children with disabilities who are age 3 through 21. Parents of preschool children who need special education and related services have the same rights as other school-age children. Special education and related services must begin on the child’s third birthday for children served in an early intervention program or for those children referred for an evaluation 60 school days before their third birthday and found eligible. If the child’s third birthday occurs during the summer, the IEP team will determine when the school district’s services to the child will begin. There is no automatic eligibility for Early Childhood Special Education Services. Parents, school personnel, and others should work together to determine if the child is eligible to receive special education services. All children in Early Intervention (EI) services are entitled to a smooth and effective transition by their 3rd birthday. The transition process begins when the child is 2 years 6 months of age. Transition begins this early because it gives parents and early intervention, school and other early childhood professional’s time to meet, share information and plan. When the child is 2 years 6 months of age, the EI service coordinator will ask the parent to sign consent so a referral packet can be sent to your local education agency (LEA). The service coordinator should be notified if the parents want the child’s information sent to other preschool programs in the community. The child’s referral packet will be sent after the parents sign for consent. Without the consent, the service coordinator will not be able to send the packet and the child’s transition process will be delayed. If the parents have concerns or questions about sharing information, they may want to discuss those concerns with a parent liaison or service coordinator. • concerns about a child’s complex medical needs. If parents would like to start transition earlier, they should speak with their service coordinator as soon as possible. When the child is 2 years 9 months of age, the service coordinator will hold a Transition Planning Conference that will include parents, the service coordinator and a school district representative. Parents may want to invite other professionals, family members, or representatives from community programs. The Transition Planning Conference is an opportunity for the parents to learn about the school district and for the school district representative to learn about the child. It is not a meeting for making decisions about eligibility, services or determining where the child might go to school. The school district or special education cooperative representative will contact the parents about participating in a Domain Review after the Transition Planning Conference. The purpose of a Domain Review is to figure out if additional information is needed before the IEP team can determine if the child is eligible for Early Childhood Special Education services. The domain form is used to keep track of the Domain Review. This form can be filled out at a meeting the parents attend with other IEP team members. It may also be filled out by the child’s IEP team, and one team member may then review the form with the parent. The domain form is also called the Identification of Needed Assessments form. Even though the parents and the child received services through Early Intervention, there is no automatic eligibility for Early Childhood Special Education services. Parents will be involved in helping the school district or special education cooperative gather needed information to help determine if the child is eligible. It is very helpful for parents to share information about the child with other IEP team members. Parents know what the child has learned, what the child likes and dislikes, and they understand how the child likes to play. The evaluation procedures for special education that would be used for an elementary or high school-aged child would also apply to preschool children suspected of having a disability which will adversely affect educational performance. The IEP or IFSP must be developed and services must be in effect beginning on the child’s 3rd birthday. 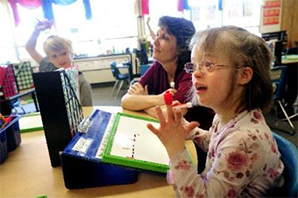 The type, amount and location of special education services provided must be based on the child’s needs. The law requires that preschoolers receive their services together with children without disabilities, to the maximum extent appropriate. If you have a question regarding early childhood services law, or need an early childhood services law attorney, please contact us for a FREE EARLY CHILDHOOD SERVICES CONSULTATION.